A Racheal Ray "30 minute meal". Don't even get me started. In fact, I am not a HUGE RR fan. However, this a great recipe for all you Gyro lovers out there. We all know we can't replicate the delicious shaved lamb, so I think this recipe is a nice compromise. Bonus: you can use ground chicken (and you secretly can't really tell the difference and it is way cheaper). I didn't include Rach's orig. recipe because I changed it by omitting her chutney and adding a recipe for Tzatziki. This meal is fairly quick and easy, even though you do need to haul out the ol' food processor (although you could easily make do without one). Basically you make two things: the patties (super easy) and the Tzatziki sauce (easy but there is some waiting time, make ahead of time). The one strange thing you may find while making the patties is that they are very wet/loose. Don't worry, that is how they should be. It is easiest to preheat the skillet or griddle, form the flat patties, and then place them directly on the cooking surface. I think the only other thing that might give you some troubles is finding Greek yogurt. I found it at King Soopers ("your regular old super market"). It is a little pricey, but the meal overall isn't bad. If you can't find the Greek style yogurt, you can buy plain yogurt and drain out the liquid with a cheese cloth (or thin rag). Probably not worth it, though. Although, the Tzatziki really makes it amazing. I am a seasonal cook and eater. This is definitely more a summer meal for me. I made this recipe several times last summer, before I started being really good about taking photos of all my food. However, I had a recommendation from one of my besties to post something like a Gyro. Therefore, I dedicate this second blog to Gups. For Patty Pockets: Place the herbs in a food processor and pulse grind them into a fine chop (or finely chop by hand). In a bowl combine the herbs, yogurt, cumin and grill seasoning. Add the meat and mix to combine. Form into 4 large, very thin patties. Wash up and preheat a large nonstick skillet or griddle pan with a couple tablespoons extra-virgin olive oil over medium-high heat. Cook patties 3 to 4 minutes on each side. Heat a small second skillet over high heat and blister the pitas on each side. 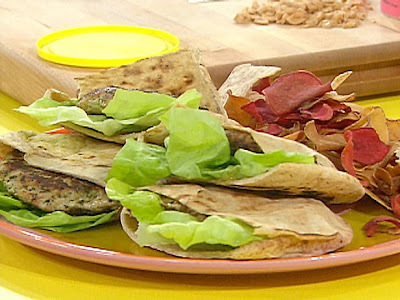 Cut tops off the bread and fill pita pockets with patties, lettuce, tomato and Tzatziki. Serve with spiced exotic chips like Taro root chips. Or you could serve with fresh cut veggies and use the rest of the Tzatziki as a dipping sauce.